Batra played it safe early in his career, writing only about technical issues. Now will they listen to Ravi Batra? The worst economic cycle in more than half a century has everyone from struggling homeowners to former Federal Reserve chairmen shaking their heads in disbelief. Jobs are disappearing, retail sales are in the toilet, bankruptcies of major companies are a daily occurrence, and an unprecedented, massive government bailout has failed thus far to unfreeze the credit system that is the lifeblood of U.S. capitalism. Even the iconic architect of the current economic system himself, former Federal Reserve Chairman Alan Greenspan, told a Congressional panel several months ago that his deregulation and debt-is-OK approach was mistaken. But what exactly is causing the current worldwide financial meltdown, Greenspan said, he�s still trying to figure out. 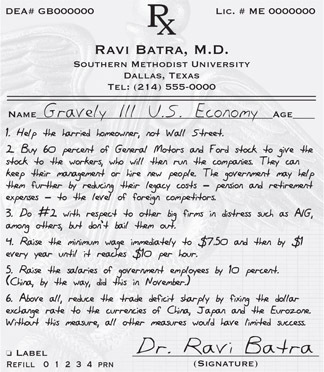 In Dallas, Ravi Batra is also shaking his head � but for different reasons. The veteran Southern Methodist University economics professor saw this storm approaching years ago and has written several books, including a couple of best-sellers, about what the country should have been doing to handle it. He wrote Greenspan�s Fraud in 2005. And in his 2006 book, The New Golden Age � The Coming Revolution Against Political Corruption and Economic Chaos, he predicted an economic depression and the rise of a charismatic leader who might help dig the country out of that hole. In fact, the 65-year-old Indian-born academic has an amazing record of economic and social forecasting going back several decades, from the rise of Islam, which he predicted in the 1960s, to the mergers booms and soaring stock prices of the �90s, and the stock market crash of 2000. In the futurist field, where a 65 to 70 percent accuracy rate is acceptable, he has a nearly 90 percent record of being right. 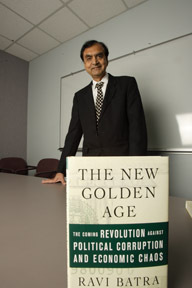 �Ravi is a phenomenon � the best predictive record of any economist, past or present � and he does it all by reference to recorded, empirical facts, not paradigm [or] ideology,� said Prof. Rajani Kannepalli Kanth, a visiting scholar at Harvard University who specializes in political economy and social anthropology. His supporters think Batra should long ago have won a Nobel Prize and that President-elect Barack Obama ought to be calling him with offers of cabinet posts or at least asking for his advice. But instead, despite his sterling record and best-selling books, Batra remains somewhat isolated in the economics field, the result of one bad call and, more to the point, an economic theory that flies in the face of today�s accepted wisdom � in the face, that is, of the theories and practices that got us in the horrendous spot we�re in today. That could be very bad news for Americans and for the world. Because, despite the fact that Batra predicted the rise of a leader like Obama, he believes that much of what Obama is proposing to do to combat the economic crisis is as wrong-headed and will be as ineffective as the measures taken thus far. He thinks the massive bailouts are mostly �crisis profiteering,� with government help going largely to the wrong people and institutions. �It could get as bad as the Great Depression if they�re not careful. So far, they�re not showing any good signs of recovery,� Batra said. He compares the current mistaken focus on bailouts � from Wall Street to the auto industry � to the early mistakes of another president faced with economic disaster: Franklin Delano Roosevelt, whose initial rejection of the revolutionary concepts of John Maynard Keynes helped prolong the worldwide economic misery of the late 1920s and 1930s. It may take another heretic to pull America out of its current downhill slide this time around. If so, North Texas has one to offer. Batra never intended to become an economist. After graduating from high school in New Delhi with perfect grades, he announced to his father that he wished to pursue an engineering career, like his friends. His father had other ideas. Harish Batra wanted his highly intelligent son to become a top government official via the Indian Administrative Services (IAS), and thought that economics would be the best way to get there. Now 95 and still healthy, the elder Batra has translated some of his son�s books into Hindi. And he�s thrilled with his son�s success, even though he didn�t end up in Indian government. 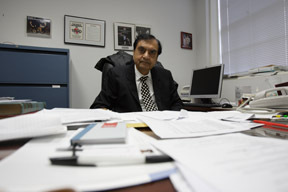 Batra emigrated to this country in 1966 and earned his Ph.D. in 1969 at Southern Illinois University. He taught at several schools before taking an assistant professorship at SMU in 1972. He was already forming some out-of-the-mainstream economic views, including about wealth concentration, but he knew they�d be unpopular, especially in Big D. So he played it safe for a while, writing books and journal articles on highly technical economics issues. �I wanted to get tenure before I would venture into anything risky,� he said. He earned tenure in just a year, in part because he was already boosting SMU�s ranking for publications in national journals. Prior to his arrival, the university�s faculty ranked 99th in overall journal publishing; three years after his arrival, it was 15th. At SMU, his intelligence and credentials earned respect, though he hasn�t always been understood or appreciated. Batra, too, felt it was time to take the next step and to begin going public with the contrarian theories that would bring him both fame and isolation. In 1987, Batra wrote the book The Great Depression of 1990. When that downturn didn�t happen, the appetite for his articles in scholarly journals dried up. Batra and his supporters point out that most of the other predictions in the book have happened, just on a different timeline. Thom Hartmann, who has featured Batra regularly on Air America�s nationally syndicated �The Thom Hartmann Program� for the past several years, believes Batra might have been right about hard times in the 1990s had foreign countries such as China not loaned the U.S. so much money, which essentially delayed a big depression until, you got it, right about now. Batra speaks somberly about suffering in those years after the flawed prediction, both from reduced income � he missed out on promotions, pay raises, and job opportunities � and professional status. The personal nature of some of the criticism was the most difficult for him. There�s no reason, he said, that Batra couldn�t make the same rise from obscurity to ubiquity as happened to economist Milton Friedman when President Ronald Reagan endorsed his supply-side, trickle-down theories of economics and deregulation. And revolutionary economic theories have won the day before then � most particularly when the belated adoption of John Maynard Keynes� ideas helped pull America and the world out of the Great Depression. Keynesian economics, which Batra�s theories resemble on some levels, asserts that government plays a role in spurring economic activity in the private sector through public projects, progressive taxation, and interest rates. It�s no wonder, though, that Batra�s predictions and recommendations haven�t been popular on the national stage in recent years. He considers the advantages of free trade to be highly overrated and thinks higher income tax rates would help the economy. He�s certainly not the first person to suggest that dramatically increasing tax rates on the rich would help the economy. The argument has been made before � and is popping up again. 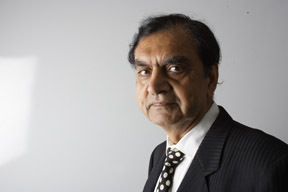 At the core of nearly all his predictions (detailed on his web site, www.ravibatra.com) is the premise that an increasing gap between rich and poor can destroy a society. Not exactly a program that either Bush president would have endorsed. Batra�s approach to forecasting is based on historical cycles of inflation, money growth, and depression as well as the law of social cycles imparted by his late teacher, P.R. Sarkar. It�s a theory that some social scientists but few, if any, other economists employ. The idea is that history shows that societies are, predictably, led by one of four types of people: laborers, warriors, intellectuals, or acquisitors. Simply put, each type exemplifies different skills and qualities, and each group sits at the top of the pecking order for a time, until it has worn out its welcome and another of the group assumes power. Under the theory of social cycles, each age is characterized by different values. The acquisitors age, for example, is characterized by rising individualism and weakening family ties, the propensity for war and other competitive acts aimed at acquiring resources, and rising concentrations of wealth. The age of intellectuals sees less interest in materialism, more mental discipline, and the lowest crime levels of any age, but also excessive rules and regulations as well as a poor economy. In his most recent book, Batra wrote that we�re nearing the end of the acquisitors stage, which is characterized by the business and money class ruling society with its excessive attention toward profit at all costs. Next stop in America�s collective social evolution, he believes, will be a revolution by laborers, followed by the age of warriors � not soldiers, necessarily, but people more willing than others to take risks because of their above-average courage. After The Great Depression of 1990, Batra�s colleagues told him to �calm down,� but he kept on. He wrote The Myth of Free Trade next, claiming free trade itself could destroy America�s economy. He encountered significant resistance from more mainstream colleagues. Batra says his adherence to social cycles combined with his use of historical cycles of inflation, money growth and depression allows him to be more accurate than traditional economists relying on econometrics � that is, statistics and economics theory alone. His view that rising productivity isn�t good if it�s accompanied by stagnating wages (a result of outsourcing) or debt has led to Batra�s being called �Dr. Doom� and worse. Angry diatribes of critics of such views haunt his online book reviews to this day. The economist developed his wage- gap theory after studying the stock market bubble of the 1990s. He recognized that productivity was rapidly outpacing wages, bringing windfall profits to society�s affluent but leaving others behind. From this research resulted The Crash of the Millennium in 1999 in which Batra predicted the stock market crash that began in December 2000. The people who are already ranting about Obama�s supposed desire to redistribute wealth won�t like Batra�s ideas either. But the SMU professor said his research has reinforced his theory that America�s growing rich-poor gap is destructive. He pointed out that, on the eve of the Great Depression, 1 percent of the people in this country owned 36 percent of the wealth � the highest wealth concentration in this country, up to that point. Currently, the richest 1 percent of U.S. households have 38 percent of the wealth, according to Edward Wolff, professor of economics at New York University. In 2005, the Fed chairman�s continued love affair with debt and rising productivity at the expense of wages led Batra to write Greenspan�s Fraud, a searing critique of Greenspan�s economic policies since 1987. Less than two months ago, Greenspan told the House Committee on Oversight and Government that he was �in a state of shocked disbelief� at the country�s economic crisis and, when pressed, admitted that he�d �found a flaw� in his theories that had pushed him into mistakes. �After the market crashed, Greenspan went back to the same old recipe: He cut interest rates, so people borrowed more,� the professor said. �I thought, �This guy is so dangerous for the world � he�s all wrong.� � It�s the same conclusion that Greenspan himself admitted to more recently. In November 2006, The New Golden Age was published. In it, he wrote that the current crisis would begin in mid-2007 and be characterized by rising unemployment, soaring consumer and government debt, and huge stock market losses. National leaders would be late in identifying � and thereby responding to � the crisis because the traditional criteria for defining a recession (a drop in output for two consecutive quarters) is outdated, given today�s trend toward outsourcing. Because so many companies have sent so many jobs overseas, he said, productivity can rise while American wages stagnate and even shrink. There�s an updated version of the book out this month, with new predictions. Looking at current conditions using Batra�s model, the ongoing economic implosion isn�t hard to fathom. Batra says that�s what happens when wages remain flat while productivity and debt rise together and wealth becomes more and more concentrated. When productivity rises, more goods are produced. But since wages are flat, consumers have no extra money to buy the extra goods. And when sales shrink, the whole downward spiral begins. A man who likes to make self-deprecating jokes during interviews, Batra grows serious when asked how he feels about his latest predictions regarding the current economic crisis. His supporters call it a travesty that he�s isolated within the economics field. The SMU futurist thinks the approaches taken thus far by Congress and the White House have, for the most part, only worsened the economic storm that is spreading worldwide. His opposition to the bailouts is shared by critics across the political spectrum. To start with, Batra believes Treasury Secretary Henry Paulson (a former Goldman Sachs CEO) was allowed to manipulate the news media, Congress, and the market to direct hundreds of billions of dollars to his former colleagues on Wall Street. �It�s official corruption, what else?� Batra says. �George Bush appoints guys who are not just pro-business but the former CEO of Goldman Sachs.� The government�s help, he said, should have been directed toward homeowners and lenders, not major borrowers such as Goldman Sachs. The most recent steps, allegedly aimed at pulling the system out of a tailspin, have Batra less convinced than he was a month ago that Obama will in fact lead the U.S. economy into the promised land. �There is not that much difference as far as economic policy is concerned between what President-elect Obama is talking about and what President [George] Bush or Hank Paulson did � in the sense that they are going to create more government debt in the economy and hope that this will solve the problem,� Batra said. Obama�s naming of Timothy Geithner as treasury secretary is another sign that the president-elect may not be planning great changes. �Geithner might help the little guy some, but he�ll probably continue these same policies,� Batra said. And what about Obama�s gargantuan public works program proposal, which harkens back to FDR�s New Deal? 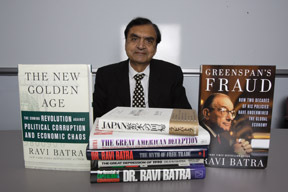 Adding more debt, along with deregulation started in the Reagan years and exacerbated by Greenspan�s monetary policies, is what brought the country to this catastrophic place, Batra says. �The assumption that the government can borrow and have as much money as it likes and have no consequences; that has never happened. In the end, debt unravels and brings about much more misery than there has to be,� he said. Until the nation realizes that it has to get money and power to the lower levels on the socioeconomic ladder, he said, all proposals are merely Band-aids. While he thinks that some help for the auto industry is needed, he�s outraged at the recent bailout debate, seeing the demands in Congress for auto worker wage cuts as a glaring example of class prejudice. �When they were talking about Wall Street, nobody asked for wage cuts,� Batra said. The nation�s whole political and socioeconomic culture needs to change, Batra believes � the same kind of overhaul that was so badly needed at the beginning of the Great Depression. In the 1930s, leaders failed to bail out the banks, rejecting the Keynesian call for government intervention to stabilize the private sector. This time around, leaders are making darned sure they don�t forget the banks, but they�re misguided in their approach, Batra said. It�s foolish, he said, for Congress to be wondering why the banks aren�t using the bailout money to help homeowners and other borrowers. �The banks aren�t getting paid back on their earlier loans because people are up to their necks in debt ... and the banks are paying interest [to the government] on this money,� Batra said. One of the few proposals he�s liked has come from FDIC chief Sheila Blair, who has been calling for targeted loan flexibility and related assistance to help homeowners who are delinquent in their mortgage payments. Cutting the interest rate to a historical low won�t do it, Batra and others say, because if middle- and low-income Americans are not able right now to even buy Christmas gifts, lower rates aren�t going to be enough to help them buy homes. � He�d increase the minimum wage immediately by $1 per hour and by the same amount for several years until the rate reached $10 an hour. He would also increase the pay for government employees. � He�d implement some version of Blair�s plan to help struggling homeowners. � And finally, he would use $10 billion or so to spark improvements in the sick auto industry (a fraction of the amounts than have been thrown around lately). Of that, $5 billion would go toward buying 60 percent of General Motors stock. Stock, as well as company control, would be given to workers, who could keep or fire CEOs and chief managers and who would have to be more productive to keep their jobs. The other $5 billion would go toward retirement and pension costs � legacy expenses. �It�s called mass capitalism � capitalism at the level of the masses. It�s not socialism, which means government ownership of property. That�s what they are doing with banks right now,� Batra said. The plan also would appeal to critics of unions, he said, because it would put force union workers to be more productive to save their jobs. He sees a very rough year � or three � ahead. Despite all that short-term pessimism, he�s convinced that positive change is on the way as well. He sees it in his historical economics cycles and the social cycles. The revolution, which he believes could happen in a couple of years or sometime soon after that, should bring in a new chapter of greater economic equality and less poverty and suffering � first in the U.S., then rippling out to the rest of the world, he thinks. �The U.S. has never been in any other age other than the age of acquisitors. So this will be a new experience for the U.S.,� he said. �America is endowed with incredible natural resources, a lot of productive land, very hard-working people, and a great diversity of people who bring enormous talent to this country, so this phase will pass. Prosperity will make a comeback, and the U.S. will maintain its superiority,� he predicted. Meanwhile, the economic unraveling continues. More than 2 million jobs disappeared in this country in the first 11 months of this year. At press time, an agreement on an auto industry bailout remained out of reach, the debate increasingly punctuated by a growing chorus of skeptics. From Capitol Hill to factories and farms and houses across the country, people are desperate to understand the nature of this beast. For that answer, listen to Batra, his supporters say.